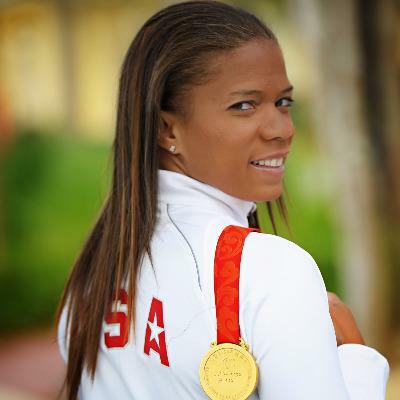 Gold Medal winner, empowering clients and teams to train for their transition and win their "Gold Medal Moment"
Raised with a hard work ethic, which she has honed with a will of steel, April Holmes has redefined what it means to be disabled. April was involved in a train accident in 2001 which resulted in the loss of her left leg below the knee. While she lay in her hospital bed, a doctor told her about the Paralympic Games and three goals were firmly implanted in her mind. She desired to wear the USA uniform. She wanted to break world records. She was determined to win gold medals. Since her career in Paralympic track & field began in 2002, Holmes has continued to succeed, improving each and every step of the way. Over her astonishing career, April was honored to wear the USA uniform at every major championship 2002-2016. She has put together several undefeated seasons, broken IPC World Records fourteen times and American Records eighteen times in the 100, 200, 400 meters and the long jump, won 3 Paralympic medals (1 Gold, 2 Bronze); and 5 World Championship medals. With a commanding lead over the growing field of competitors, Holmes had a way of captivating track enthusiast with her grace and style. Off the track, Holmes runs the April Holmes Foundation, Inc. a non-profit organization assisting people with physical and learning disabilities with scholarships and medical equipment. Having completed her MBA in Marketing, Holmes uses her education to improve the awareness of people with disabilities. April was named by the International Paralympic Committee’s “Top 10 Women in Paralympic Sport”, NCAA 2015 Inspirational Athlete of the Year, US Anti-Doping Ambassador, assisted First Lady Michelle Obama on the “Let’s Move” Campaign, and recently spoke at the United Nations Sport & Social Impact Summit. April is a well-sought after corporate and motivational speaker and enjoys opportunities to share her life, medals and journey with others. She has electrified audiences with messages of motivation, diversity, leadership, and marketing. Some of her clients include Wal-Mart, Disney, Dow Chemical, Hartford Insurance, and BMW. April also assists companies in Olympic-themed sporting days to enhance the core values of teamwork, determination, discipline, and goal setting.